Business Calendar Pro 1.4.9.4 is a critically-acclaimed highly-customizable replacement for android's stock calendar. Its flexibility and power of organization make the app a must. Download below. By the way, Business Calendar 2 has been released! 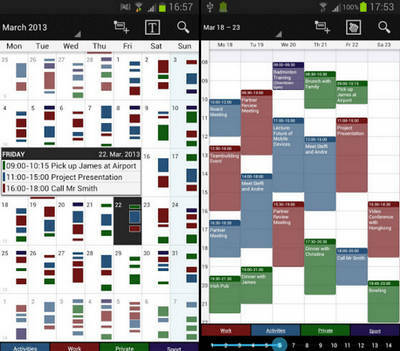 Business Calendar Pro (downloadable below) is the highest-rated, most stable calendar application on the android market. Please check out the full list of features on the Play Store. More details on Google Play..
Business Calendar 2 is released, download it in the Play Store! The pro features of BC 2 will be activated when the old Business Calendar Pro is installed. New users should only download BC 2 and activate pro features within the new app.